Have you ever wondered or pondered just where the term “Thrash Metal” originated? Who came up with it and just what or who in the hell inspired them to come up with it? It pretty well had to be some ferocious, animated metal band of the past, more than likely in the early to mid-Eighties, based on what we do know. The list of possible candidates is a limitless one, of course, yet we owe them such a debt of gratitude, whoever they are or were. If you happen to look up the word “thrash” in a dictionary, one of the definitions given is “to toss, or plunge about” and for me, that pretty well sums it up… just picture a mosh pit. It totally fits and makes sense, right? The subjects of this review, Boston’s brash bad-asses of sonic bludgeoning and bashery, BLACK MASS, released their second full-length album, ‘Warlust‘, through Iron Shield Records back in February. Since then, the record’s musical contents have ravaged fans of the band, along with the denizens of the metal underground lucky enough to run into it… or had it run into them, whichever. Formed in 2012, the band are a true power trio, but it ain’t power metal they specialize in, not even close. Instead, BLACK MASS – Brendan O’Hare (lead/rhythm guitar, vocals), Cristian Azevedo (bass, backing vocals), and Alex Fewell (drums) – are all about POWERFUL metal, the type that is intense and absolutely savage. It is not all too far removed from their obvious influences either, the old-school thrash bands that originally pioneered the movement like Slayer, Exodus, or Kreator. Speaking of movement, the ‘Warlust‘ album begins with a brief intro piece relating to the perceived conceptual theme running throughout: War. Once ended, things explode with the inflamed guitar riffing that heralds title track, “Warlust“, and before you know it, a drumming assault is taking place. With things now fully engaged, a frenzy of manic metal is whirling wildly, whipping away at the listener as snarling, aggressive vocals join the fray. Following that, things continue to escalate with the thrashing battery of the tracks “Programmable Life Forms“, “High Priest In Black“, and the Motörhead-meets-Venom madness of “Graveyard Rock“. At this point, we get a glimpse of a whole other musical side to BLACK MASS with the peacefully tranquil, acoustic enhanced instrumental piece, “Interlude“. After what we just experienced via the four earlier tracks, this much-needed breather is an amazing revelation of the band’s true capabilities and, in my opinion, something that would be interesting to hear them explore further – food for thought. The respite is minimal as the interval ends and “Hellhounds” comes a’barking and howling, by means of the chunky riffs now firing away. They are just an appetizer though, what drives their advance is an impressive turn into grindcore style drumming blast beats. Winding itself tighter, the rhythm section of the song are working up some nearly inhuman speeds, their rapid interaction arrives in dizzying flurries. This type of agitated audio incineration is a formula that returns in the tracks “Virgin Sacrifice” and “Fueled By Drugs“. The latter does briefly detour itself into a bit of headiness at some passages near the end of the song, I’m guessing when the referenced narcotic propellant has more fully kicked in. For my personal tastes, one song in particular is the quintessence of this album and the band, the phenomenal “Bible Stomp“. A bit of hacking at the drum kit kicks things off, soon joined by rumbling bass lines and chugging chunks of guitar all melding together. Then we find ourselves amid a toxic waltz of slightly slower, circling grooves and revolving riffs, the song’s lyrics detailing injustices carried out by agents of organized religion. Momentum builds within the music, the lyrics grow more controversial, eventually calling for violence against the criminal clergy, as the music reflects the fury of the fictional person narrating the tale. Clearly, BLACK MASS are not out to reinvent the wheel, which is just fine by me because we need fierce, volatile bands like this. Not just for our entertainment or enjoyment, for the way I see it, that takes a back seat to the twofold thing we need most. First, we need contemporary metal bands that remind us of our collective history in this genre marked by heaviness, aggression, and extremity. Ones like BLACK MASS that channel elements of the past. Second, in an age I see marred by maddening political correctness to such a point that many people have become docile, we desperately need BLACK MASS and bands of similar ilk. You know, those that are the very embodiment of the No-Fucks-Given attitude… and right here ya go! 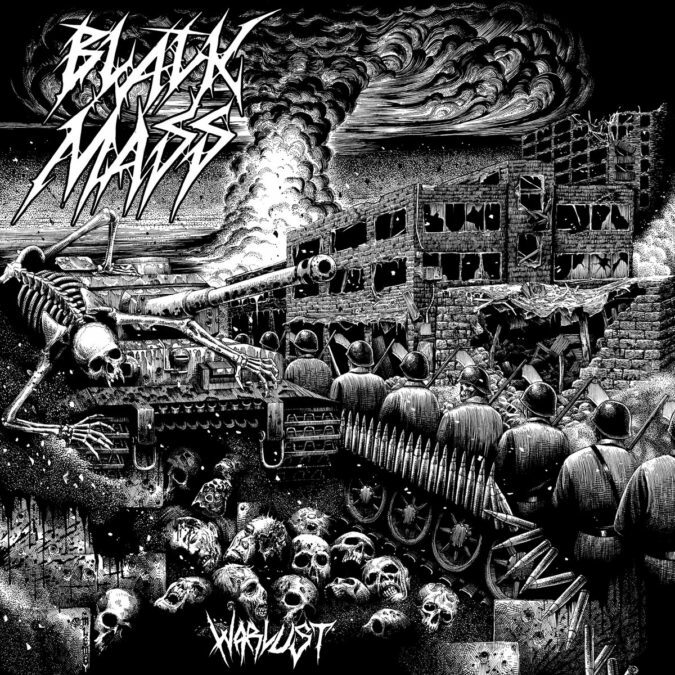 Stream the ‘Warlust‘ album from BLACK MASS above in this review or charge on over to Bandcamp [HERE] for further streaming and purchase options. Also, BLACK MASS will embark upon an eastern U.S. tour beginning early next month – find their itinerary below. 2019, Album Art, Album Review, Audio Stream, Bandcamp, Black Mass, Iron Shield Records, Massachusetts, Metal, Review, Streaming, Thrash, Tour Dates, U.S.